Comments The Mojahedin Khalq Organization (MKO) is an armed Iranian opposition group that was formed in 1965. An urban guerrilla group fighting against the government of Mohammad Reza Pahlavi, it was an active participant in the anti-monarchy struggle that resulted in the 1979 Iranian revolution. At present, the MKO is listed as a terrorist organization by the U.S. State Department and several European governments. The MKO’s leadership is engaged in an extensive campaign aimed at winning support from Western politicians in order to have the designation of a terrorist organization removed. After the revolution, the MKO expanded its organizational infrastructure and recruited many new members. However it was excluded from participating in power sharing arrangements, and the new revolutionary government under the leadership of Ayatollah Khomeini forced it underground after it instigated an armed uprising against the government in June 1981. The majority of its top cadres went into exile in France. In France, the MKO continued its active opposition to Iran’s government. In 1986, under pressure from the French authorities, the MKO relocated to Iraq. There it established a number of military camps under the banner of the National Liberation Army and maintained an armed presence inside Iraq until the fall of Saddam Hussein’s government in 2003. During the Iran-Iraq war, the MKO fighters made regular incursions into Iranian territory and fought against Iranian government forces. After the end of Iran-Iraq war, the group’s armed activities decreased substantially as Saddam Hussein’s government curtailed the MKO’s ability to launch attacks inside Iranian territory. Some MKO fighters took advantage of an amnesty offer by the Iranian government. Since October 2004, 273 MKO members have returned to Iran.4 The U.S. military has recognized the MKO fighters in Iraq as Protected Persons under the Geneva Conventions.5 Their fate remains uncertain; the Iraqi government and the U.S. military appear not to have reached a decision regarding their future. During Saddam Hussein’s last year in power, some Iranians held in Abu Ghraib prison were repatriated to Iran in exchange for Iraqi prisoners of war (POWs). These were dissident members of the MKO who had been sent by the organization for “safekeeping” in Abu Ghraib.6 The release of these prisoners in 2002-2003 provided a direct window into conditions inside the MKO camps that was previously inaccessible to the outside world. The former MKO members reported abuses ranging from detention and persecution of ordinary members wishing to leave the organization, to lengthy solitary confinements, severe beatings, and torture of dissident members. The MKO held political dissidents in its internal prisons during the 1990s and later turned over many of them to Iraqi authorities, who held them in Abu Ghraib. In one case, Mohammad Hussein Sobhani was held in solitary confinement for eight-and-a-half years inside the MKO camps, from September 1992 to January 2001. The witnesses reported two cases of deaths under interrogation. Three dissident members – Abbas Sadeghinejad, Ali Ghashghavi, and Alireza Mir Asgari – witnessed the death of a fellow dissident, Parviz Ahmadi, inside their prison cell in Camp Ashraf. Abbas Sadeghinejad told Human Rights Watch that he also witnessed the death of another prisoner, Ghorbanali Torabi, after Torabi was returned from an interrogation session to a prison cell that he shared with Sadeghinejad. The MKO’s leadership consists of the husband and wife team of Masoud and Maryam Rajavi. Their marriage in 1985 was hailed by the organization as the beginning of a permanent “ideological revolution.”7 Various phases of this “revolution” include: divorce by decree of married couples, regular writings of self-criticism reports, renunciation of sexuality, and absolute mental and physical dedication to the leadership.8 The level of devotion expected of members was in stark display in 2003 when the French police arrested Maryam Rajavi in Paris. In protest, ten MKO members and sympathizers set themselves on fire in various European cities; two of them subsequently died.9 Former members cite the implementation of the “ideological revolution” as a major source of the psychological and physical abuses committed against the group’s members. Human Rights Watch interviewed by telephone twelve former members of the MKO living in Europe. These witnesses provided credible claims that they were subjected to imprisonment as well as physical and psychological abuses because they had either expressed criticism of the MKO’s policies or had requested to leave the organization’s military camps. Each witness was interviewed separately several times between February and May 2005. All witnesses are currently living in Europe. More than twelve hours of testimonies were collected. All interviews were conducted in Farsi. Each witness provided independent accounts of their experience inside the MKO camps, and their testimonies corroborated other evidence collected by Human Rights Watch. A number of witnesses who were detained and tortured inside the MKO camps named Hassan Ezati as one of their interrogators. Hassan Ezati’s son, Yasser Ezati, also interviewed for this report, confirmed his father’s identity as a MKO interrogator. Of the twelve former MKO members interviewed for this report, eight witnesses11 left Iraq between 2002 and 2004. The remaining four witnesses12 left Iraq in the aftermath of the first Gulf War in 1991. In addition to being held in internal MKO prisons, five of the witnesses13 were imprisoned in Abu Ghraib prison prior to their release. The MKO was founded in September 1965 by three graduates of Tehran University: Mohammad Hanifnezhad, Saeed Mohsen and Asghar Badizadegan.14 The three shared a history of political activism within the religious-nationalist movement and its affiliated Islamic Students Associations. They believed that opposition forces against the Pahlavi government lacked a cohesive ideology and required revolutionary leadership. They reasoned that peaceful resistance against the government was fruitless, and that only a revolutionary armed struggle could dislodge the monarchy. The organization’s founding trio focused their initial thrust on creating a revolutionary ideology based on their interpretation of Islam that could fuel an armed struggle by persuading masses of people to rise up against the government. This ideology relied heavily on an interpretation of Islam as a revolutionary message compatible with modern revolutionary ideologies, particularly Marxism. During its first five years, the MKO did not carry out any operations against the government. It primarily focused on developing a revolutionary ideology and training its members in urban guerilla warfare. In 1970, thirteen MKO members traveled to Jordan and Lebanon and received military training inside Palestinian Liberation Organization camps. They returned to Iran after a few months. Prior to carrying out any armed activities, the group planned to focus on developing its ideology and training its new recruits. However, this strategy was thwarted by the emergence of a competing Marxist guerilla group, the Fadaian Khalq Organization. On February 8, 1971, members of the Fadaian launched their first operation by attacking a police station in the village of Siahkal in the northern province of Gilan. This incident marked the emergence of armed struggle against the shah’s government. The MKO’s leadership, surprised by the Siahkal incident, decided to expedite their plans for armed operations by organizing a spectacular attack in Tehran. At this time, the government was in the midst of promoting a large-scale celebration marking 2500 years of monarchy in Iran. The MKO planned a series of bombings that would target Tehran’s electric power grids prior to the opening eve ceremonies. The three founding members of the MKO, along with six others from the group’s Central Committee, were sentenced to death and executed on May 25, 1972. Only two members of the Central Committee, Masoud Rajavi and Bahman Bazargani, escaped firing squads when their death sentences were commuted to life imprisonment. The 1971-72 waves of arrests, executions and imprisonments dealt a severe blow to the MKO, but its remaining members who escaped detection by the security forces continued to recruit new members as well as carrying out a number of armed operations. In 1975, intense ideological differences among the MKO members led to the departure of a sizable number of members, who argued that religious thought was incompatible with revolutionary struggle. This offshoot of the MKO was briefly known as the Marxist Mojahedin and was later renamed Peykar Organization. The MKO members who stayed loyal to the group’s original ideology referred to this event as an internal coup. On the eve of the 1979 Iranian revolution, the imprisoned MKO members were released along with other political prisoners. The group quickly turned its attention to building a nation-wide organization. Masoud Rajavi emerged as the top MKO leader. The group was particularly successful in gaining the sympathies of middle class educated youth. It established offices throughout Iran and built a network of militia that were highly active inside university campuses and high schools. While supporting the leadership of Khomeini in the immediate aftermath of the revolution, the MKO leaders never managed to gain his trust, and as a result were excluded from power-sharing arrangements in the post-revolutionary government. An intense rivalry developed between the MKO and the Islamic Republican Party (IRP), formed by Khomeini’s disciples. The first president of the republic, Abol-Hasan Banisadr, elected in 1980, also faced serious opposition from the IRP. In the first months of 1981, differences among competing political factions reached a critical juncture. President Banisadr came under intense political pressure from the IRP, which controlled the parliament and most branches of the government and security forces. The MKO and Banisadr formed an alliance to try and thwart the IRP’s drive to consolidate its control over every part of the state. On June 19, 1981, Banisadr and Rajavi called for massive demonstrations nationwide. They hoped to duplicate the pattern of the anti-shah revolution by instigating a popular uprising. On June 20, 1981, large-scale street demonstrations were held in Tehran and many major cities. However the authorities used Revolutionary Guards to suppress the uprising, killing hundreds of demonstrators in street clashes. In Paris, Rajavi and Banisadr consolidated their alliance by declaring the establishment of the National Council of Resistance (NCR) as a coalition of opposition forces, advertising itself as “the democratic alternative” to Iran’s government. The Kurdish Democratic Party of Iran (KDPI) and a number of prominent intellectuals and individuals also joined the NCR. 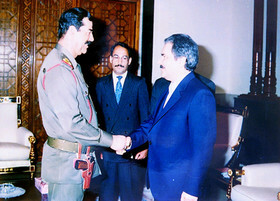 After the end of the Iran-Iraq war, Saddam Hussein limited the MKO’s military activities against Iran. The lack of military activity inside the MKO camps in Iraq coupled with an acceleration of the “ideological revolution” led to a rising tide of dissent inside the organization. Former MKO members interviewed for this report cite the following reasons for their decision to leave the organization: military failure of the MKO to dislodge the Iranian government during the July 1988 military operation, forced mass divorces instituted as part of the “ideological revolution” and their persecution and torture by the MKO operatives during “security clearances” in 1994-1995. These three developments are discussed below. The MKO trained its fighters under the banner of the National Liberation Army (NLA) inside Iraq. The NLA established several military camps in Iraq and trained thousands of guerrilla fighters to fight against the Iranian regime. During the Iran-Iraq war, the NLA fighters regularly attacked Iranian troops along the Iran-Iraq border and made several incursions into Iran. The largest operation by the NLA took place after Iran accepted U.N. resolution 598, calling for a ceasefire between Iran and Iraq. Iran accepted the U.N. resolution on July 18, 1988. The NLA forces, estimated at nearly 7,000 fighters, were immediately mobilized for an attack on Iran. This operation was named Eternal Light. The atmosphere on the base was completely different…. The mood was one of unremitting misery … It seemed everyone was in the process of the new phase of the “ideological revolution.” The only legitimate discussion was about the revolution and the exchange of relevant experiences. Apart from that nothing was important; there was no outside world…. Even poor single people were required to divorce their buffers, having no idea whom that meant; apparently the answer was to divorce all women or men for whom they harboured any feelings of love. Only later did I realize the organization demanded not only a legal divorce but also an emotional or “ideological” divorce. I would have to divorce Anna [his wife] in my heart. Indeed I would have to learn to hate her as the buffer standing between our leader and myself. During late 1994 and early 1995, many members of the MKO were arrested by the organization’s operatives inside their camps in Iraq. They were interrogated and accused of spying for the Iranian government. They were released in mid-1995 after being forced to sign false confessions and stating their loyalty to the leadership. Five former MKO members interviewed for this report were arrested during this period: Farhad Javaheri-Yar, Ali Ghashghavi, Alireza Mirasgari, Akbar Akbari, and Abbas Sadeghinejad. According to their testimonies – detailed in the next section – the purpose of these arrests was to intimidate dissidents and obtain false confessions from them stating that they were agents of Iranian government. This period was known as the “security clearance” (check-e amniyati). Human rights abuses carried out by MKO leaders against dissident members ranged from prolonged incommunicado and solitary confinement to beatings, verbal and psychological abuse, coerced confessions, threats of execution, and torture that in two cases led to death. The testimonies of the former MKO members indicate that the organization used three types of detention facilities inside its camps in Iraq. The interviewees described one type as small residential units, referred to as guesthouses (mihmansara), inside the camps. The MKO members who requested to leave the organization were held in these units during much of which time they were kept incommunicado. They were not allowed to leave the premises of their unit, to meet or talk with anyone else in the camp, or to contact their relatives and friends in the outside world. The second type of detention inside the MKO camps was called bangali shodan by the witnesses, referring to solitary confinement inside a small pre-fabricated trailer room (bangal). Dissident members who requested to leave the organization as well as ordinary members were detained in the bangals. Detention inside a bangal was considered a form of MKO punishment for members whom the leadership considered to have made mistakes. They were expected to reflect on their mistakes and to write self-criticism reports while in detention. The third type of detention reported by the witnesses encompassed imprisonment, physical torture and interrogations inside secret prisons within the MKO camps. These prisons were primarily used for persecution of political dissidents. Their existence was unknown to most members. The witnesses who suffered under this form of detention told Human Rights Watch that they were unaware that the organization maintained such prisons until they experienced it firsthand. One of the witnesses interviewed by Human Rights Watch, Mohammad Hussein Sobhani, spent eight-and-a-half years in solitary confinement, from September 1992 to January 2001, inside the MKO camps. Another witness, Javaheri-Yar, underwent five years of solitary confinement in the MKO prisons, from November 1995 to December 2000. Both were high-ranking members who intended to leave the organization but were told that, because of their extensive inside knowledge, they could not be allowed to do so. They were imprisoned and eventually transferred to the Iraqi authorities, who then held them in Abu Ghraib. Four other witnesses Human Rights Watch interviewed were detained during the “security clearances” of 1994-1995 because they were suspected by the MKO of harboring dissident views. Ali Ghasghavi, Alireza Mir Asgari, Ali Akbari, and Abbas Sadeghinejad were severely tortured, subjected to harsh interrogation techniques and forced to sign false confessions stating their links to Iranian intelligence agents. It was the start of Ramadan [February 1995] when the prison guards came to fetch Parviz Ahmadi. He was gone for a couple of hours. When they brought him back he was badly beaten and died soon afterwards. On August 31, 1992, Sobhani was moved to a prison and kept under solitary confinement for the next eight-and-a-half years. Sobhani was handed over to Iraqi officials in January 2001. He spent one month in mukhabarat prison and then transferred to Abu Ghraib. He was held in Abu Ghraib until January 21, 2002, when he was repatriated to Iran in exchange for Iraqi POWs. In Iran, he was detained and interrogated by the Iranian government. After three days, he escaped from a low security detention center and fled Iran. He is currently living in Europe. Ezati moved to Iraq with his family at the age of three and grew up inside the MKO military camps. During the 1991 Gulf war, Ezati and other children inside the camps were separated from their parents and sent outside Iraq. During the next three years, Ezati lived with three different families in Canada. These families were MKO sympathizers. In the summer of 1994, the MKO moved Ezati to Cologne, Germany, where he lived in a group-house for the MKO children. The organization recruited Ezati for military training when he was seventeen years old and sent him to Iraq in June 1997. After the American occupation of Iraq, Ezati managed to escape Camp Ashraf in June 2004. He is living in Europe. Farhad Javaheri-Yar is a former fighter with the MKO in Iraq.55 He served in various capacities in intelligence and security operations. In 1995, he became aware of dissident members being imprisoned inside the MKO camps in Iraq. He wrote a letter to his superiors requesting to be released from his duties and expressed his desire to leave the organization. His superiors tried repeatedly to intimidate him into staying. After his refusal, he was incarcerated in various prisons inside the MKO camps in Iraq from November 1995 to December 2000. He was subsequently turned over to the Iraqi officials and held in Abu Ghraib prison until January 2002, when he was repatriated to Iran. Javaheri-Yar joined the MKO in August 1982 in Tehran and became active in their underground armed resistance. He was arrested in October 1984 by the Iranian authorities and spent the following four years inside Evin, Ghazal Hisar, and Gohardasht prisons in Iran. Upon his release, he contacted MKO operatives in Europe and was smuggled to Karachi and from there to Iraq. He entered Iraq in 1989 and became an active member of the MKO’s armed wing. In July 1995, I returned to Camp Ashraf from a reconnaissance mission. During the preceding months, I had noticed a number of my friends had “disappeared.” I was told that they were inside Iran to carry out missions. I met two of them, Akbar Akbari and Ali Taleghani, who told me that they were imprisoned inside Camp Ashraf during this period and were forced to sign false confessions indicating their ties to Iranian intelligence agents and [promising] that they would never leave the MKO. Javaheri-Yar persevered with his request to leave the MKO, but was told that the organization could not relieve him of his duties because of his extensive knowledge of MKO’s activities. Once Javaheri-Yar realized he would not be free to leave, he escaped from Camp Ashraf on November 28, 1995 and attempted to reach the Jordanian border. On November 30, 1995, he was arrested by Iraqi security forces near the city of Tikrit. He pleaded with the Iraqi forces not to return him to the MKO camp, but his pleas were ignored and he was handed over to the MKO forces in Camp Ashraf. During the next five years he was held in solitary confinement in various locations inside the MKO camps, from November 1995 to December 2000. During the first two months, I was kept inside a pre-fabricated trailer room called a bangal. I was told that I could not leave the camp but could resume life inside the camp if I chose to do menial labor, such as making bread or sweeping streets. I refused their offer, and their response was harsh. I was moved to a prison cell in Avenue 400 of Camp Ashraf. The cell’s dimensions were three by two-and-a-half meters [nine feet by eight feet]. It was connected to a narrow hallway – one meter [three feet] wide and three-and-a-half meters [ten feet] long – that led to a small toilet and sink. The MKO’s leadership, including Masoud Rajavi, promised Javaheri-Yar that he would be released “soon,” but each time they broke their promise. Javaheri-Yar was imprisoned in solitary confinement inside Camp Ashraf, as well as Camp Parsian, until December 2000, when he was turned over to the Iraqi intelligence forces (mukhabarat). He spent one month in a mukhabarat prison before being transferred to Abu Ghraib prison. He was repatriated to Iran on January 21, 2002. He left Iran and is living in Europe. One night in January 1995, I was called over by my superior and told that a member of the Central Committee wanted me in her office. I was excited to be meeting such a high level official at such an unlikely hour. I assumed there was much importance attached to this meeting. We got into a military vehicle; it was around midnight. They took me to a place inside Camp Ashraf called Iskan. It is at the far corner of the camp where a series of apartment buildings were used to house families [before they were forcibly broken up]. It was a rather isolated spot – barren desert and frighteningly secluded. There were a few people inside, five or six. I was taken to an empty room and told to wait. A few minutes later, another member, Hussein Nizam, was brought in. Hussein Nazim had spent many years inside the Islamic Republic’s prisons, so he knew something else was happening. I was somewhat naive and didn’t have much of a clue. Suddenly the door opened and a group of people attacked us mercilessly, blindfolded us, tied our hands behind our backs, and put us inside a car. We were driven around for half an hour. We stopped inside an area that was approximately at the center of the camp. I didn’t know this was a prison until I was taken there. The prison was on Avenue 400 of Camp Ashraf near the water tanker. Until then, I had assumed that explosives or sensitive documents were guarded inside. Our clothes were taken from us and we put on prison garb. We were led to a large cell holding nearly twenty-five prisoners. The prison cell was on the ground floor of the building; there was a small window near the ceiling for air circulation. A small toilet and shower were built at one end of the cell. There was a period when prisoners were taken on a daily basis for interrogations and beatings. One method was to kick the prisoner’s legs and knees repeatedly with military boots with metal covers on the front. Another method was to put a thick rope around the prisoner’s neck and drag him on the ground. Sometimes prisoners returned to the cell with extremely swollen necks – their head and neck as big as a pillow. He went to the next room while he told me how he was going to beat me up badly. He changed his shoes and put on a pair of these military boots. He came back, and two hefty guards held me. He began kicking my legs repeatedly. My legs are still unbalanced from these beatings. Interrogations sometimes lasted for up to thirty or thirty-six hours non-stop. Ghashghavi was released in May 1995, after a meeting with Masoud Rajavi who told him, “The judicial branch of the National Liberation Army has acquitted you.” After this experience Ghashghavi, explored ways to escape Camp Ashraf. On March 20, 1998, he was imprisoned for forty-five days and then turned over to Iraqi intelligence agents. He spent another forty-five days inside the mukhabarat prison in central Baghdad before being transferred to Abu Ghraib. He was repatriated to Iran on January 21, 2002. In Iran, he was interrogated and brought before a court that sentenced him to nine years in prison. After sixteen months of imprisonment, he was given a forty-eight hour release to visit his family. He used this opportunity to escape and leave Iran. In August 2003, he fled Iran and is currently living in Europe. I was arrested without notice on January 29, 1995. I was told to go to a meeting with a team who were preparing for operations in Iran. These kinds of discussions were a regular part of my duties. I was taken to a room and told to wait. Hasan Mohasel, one of the MKO’s top intelligence officers, came into the room and put a note in front of me saying that I had been arrested because I was an agent of Iranian intelligence and had infiltrated the Liberation Army. I couldn’t believe what was happening; I thought it was a joke and started to laugh. But Hasan Mohasel cursed me and told me to stand against the wall. Suddenly two or three more people entered the room and began to blindfold me and to tie my hands behind my back. I was in total shock. They put me in a car and drove around for forty-five minutes inside the camp. I was taken to a building; I didn’t know where it was. Hasan Sadat Darbandi, also known as Adel, removed my blindfold and threw me into a cell with many other prisoners. I could not believe it; I thought there had been a coup inside the organization. Each day, a number of prisoners were taken for interrogation. They were beaten badly; after they were brought back, their heads and faces were tremendously swollen. After a couple of days, it was my turn to be taken for interrogation. They asked me why I had joined the MKO. I told them I came here to fight Khomeini’s government, but they said that wasn’t true. During the first couple of days of interrogation, they beat me mercilessly. It was very depressing; I really wanted to commit suicide. I was only seventeen years old when I left Iran and came to Iraq to join the MKO. I had spent my entire adult life in their camps. Eventually, I gave up and agreed to sign the forced confessions stating that I had ties to Iranian intelligence. I was taken to a meeting with Masoud Rajavi, who told me that if I stayed for another two years, they would release me and send me to Spain. After recanting his request to leave Iraq, Mir Asgari was released. Since the organization was not going to allow him to leave, he started to design an escape plan. His plan to escape was discovered, and he was arrested again. He was kept in solitary confinement for nearly two years, from 2001 to 2003. A few months prior to the U.S. invasion of Iraq, in February 2003, Mir Asgari was turned over to the Iraqi forces who took him to the Iran-Iraq border along the Arvandrood River [Shatt al-Arab] and released him there. He is living in Europe. In 1993, he decided to leave the organization and wrote a number of letters to his superiors asking to be released. Akbari was supervisor of a section in Communications Department (Setad Ravabit). He carried out many sensitive tasks for the organization, including working as a personal body guard of Masoud Rajavi. Akbari was arrested in December 1993 and held inside a prison in Camp Ashraf. The interrogators were extremely rough. From the moment I entered the room, I was subjected to beatings. I was put on a chair that was fixed to the floor. My hands and feet were tied to the chair, I couldn’t move at all. I was beaten with a thick hose and kicked repeatedly with a military boot. My interrogator also used a pair of heavy plastic slippers to hit me in the face and head. Akbari was then taken with a group of prisoners to meet Masoud Rajavi. Rajavi told them that he had “forgiven” them and they could return to their duties. He was let out of the prison in June 1995. Akbari escaped Camp Ashraf in February 1998 and set out for the Jordanian border. He was arrested by Iraqi security forces in Ramadi and handed over to the MKO. In March 1999, Akbari was turned over to Iraqi security forces who took him to Abu Ghraib. Akbari was in Abu Ghraib until January 21, 2002, when he was repatriated to Iran in exchange for Iraqi POWs. He was detained and interrogated by the Iranian authorities. He said that during a weekend release to visit his family, he escaped and fled Iran. He is now living in Europe. For a comprehensive history of the organization, see Ervand Abrahamian, The Iranian Mojahedin (New Haven: Yale University Press, 1989). Camp Ashraf is located near the city of al-Khalis, north of Baghdad. Human Rights Watch e-mail interview with U.S. military officials, March 10, 2005. According to U.S. military sources, twenty-eight members were repatriated in December 2004, thirteen in January 2005, 100 on March 3, 2005, and 132 on March 9, 2005. “US grants protection for anti-Tehran group in Iraq,” Reuters, 26 July, 2004. Former MKO members who were held in Abu Ghraib prison told Human Rights Watch that their cell doors bore a plaque with “Mojahedin Safekeeping” [Amanat-e Mojahedin] written on it. Mojahed, No. 241, April 4, 1985. Mojahed is the official publication of the MKO, and at the time it appeared weekly. See Masoud Banisadr, Memoirs of an Iranian Rebel (London: Saqi Books, 2004). On self-criticism sessions, see pp. 210-230; on decreeing of divorce, see pgs. 307-311; on renunciation of sexuality, see pages 313-340. Immediately following Masoud and Maryam Rajavi’s marriage, the MKO military command issued a directive stating: “In order to carry out your organizational duties under the present circumstances there is an urgent need to strengthen and deepen this ideological revolution. You must pay the necessary price by allocating sufficient time and resources for absorbing related teachings … ” Mojahed, No. 242, April 12, 1985. The Social Division of MKO also issued a directive to the members stating: “To understand this great revolution … is to understand and gain a deep insight into the greatness of our new leadership, meaning leadership of Masoud and Maryam. It is to believe in them as well as to show ideological and revolutionary obedience of them.” Mojahed, No. 242, April 12, 1985. Arifa Akbar, “Human torches mark protest; 10 Iranian exiles become fireballs, two die martyrs,” The Independent, July 2, 2003. Maryam Rajavi, “Empower Iran’s opposition forces checking the Mullahs,” International Herald Tribune, January 28, 2005. Katherine Shrader, “Iranian Group Seeks Legitimacy in U.S.,” Associated Press, February 24, 2005. Farhad Javaheri-Yar, Ali Ghashghavi, Mohammad Hussein Sobhani, and Akbar Akbari were repatriated by Iraqi officials to Iran on January 21, 2002. Amir Mowaseghi was repatriated on March 18, 2003. Alireza Mir Asgari was abandoned along the Iran-Iraq border in February 2003. Yasser Ezati left Iraq in June 2004. Abbas Sadeghinejad escaped the MKO military camp on June 20, 2002. Mohammad Reza Eskandari, Tahereh Eskandari, Habib Khorrami, and Karim Haqi. Farhad Javaheri-Yar, Ali Ghashghavi, Mohammad Hussein Sobhani, Akbar Akbari, and Amir Mowaseghi were imprisoned in Abu Ghraib. “For the first time in the history of the Iranian people’s liberation struggle, an organization with a monolithic ideology, populist ideals, and a policy of revolutionary armed resistance was founded in September 1965.” Mojahedin Khalq Organization Bonyangozaran, downloaded on March 10, 2005, http://www.iran.mojahedin.org/books.htm . See alsoErvand Abrahamian, The Iranian Mojahedin (New Haven: Yale University Press), 1989. Abrahamian, The Iranian Mojahedin, p. 89. “Iran: Violations of Human Rights 1987-1990,” Amnesty International, Index: MDE 13/2/90. “Iran: Political Executions,” Amnesty International, December 1988, Index: MDE 13/29/88. See also Ayatollah Montazeri’s letters protesting summary executions in 1988, published in his memoirs. Ayatollah Montazeri was Ayatollah Khomeini’s heir apparent in 1988. Ayatollah Montazeri, Khaterat,http://www.montazeri.ws/farsi/khaterat/fehrest.htm , last accessed March 18, 2005. Among the most spectacular attacks include the bombing of the IRP headquarters in June 28, 1981 and the assassination of President Mohammad Ali Rajai and Prime Minister Mohammad Javad Bahonar in 1981. “Khomeini’s Foes Split,” Washington Post, April 4, 1984. Mojahed, No. 240, March 14, 1985. Masoud Banisadr, Memoirs of an Iranian Rebel (London: Saqi Books, 2004), p. 219. Masoud Banisadr is a relative of former president Abolhasan Banisadr. Mojahed, No. 241, April 4, 1985. Mojahed, No. 242, April 12, 1985. “Iran rebels form Iraq-based army,” Chicago Sun-Times, June 20, 1987. “Iran accepts UN truce call in eight year war with Iraq,” Associated Press, July 19, 1988. Banisadr, Memoirs of an Iranian Rebel, p. 283. “Incursion by rebels threaten cease-fire,” The Washington Post, July 30, 1988. “Rebels routed in push for Tehran,” The Guardian, September 6, 1988. Banisadr, Memoirs of an Iranian Rebel, p. 292. Mohammad Reza Eskandari, Bar Ma Che Gozasht Khaterat Yek Mojahed (Paris: Kahvaran, 2004), p. 83. Banisadr, Memoirs of an Iranian Rebel, p. 306. The concept of ideological revolution started with the “ideological marriage” of Masoud and Maryam Rajavi in 1985. Subsequently, the organization required all of its members to make an “ideological leap” by cleansing their character. This process required all members to write self-criticism reports outlining their character flaws and past mistakes. See footnote 8. Imam Zaman is the twelfth Shia Imam. According to the Shia Twelver belief, Imam Zaman is the Twelfth Imam in descent from the prophet Mohammad, who went into “occultation” in the Tenth century and will reappear on earth as a messiah at a time of God’s choosing. Banisadr, Memoirs of an Iranian Rebel, p. 307. Banisadr, Memoirs of an Iranian Rebel, p. 311. Human Rights Watch telephone interview with Farhad Javaheri-Yar, February 3, 2005. Human Rights Watch telephone interview with Alireza Mir Asgari, February 10, 2005. Human Rights Watch telephone interview with Karim Haqi, February 11, 2005. Human Rights Watch telephone interviews with Mohammad Reza Eskandari and Tahereh Eskandari, February 1, 2005 and February 10, 2005. Banisadr, Memoirs of an Iranian Rebel, p. 388. Human Rights Watch telephone interview with Abbas Sadeghinejad, February 14, 2005. Human Rights Watch telephone interview with Ali Ghashghavi, February 9, 2005 and May 6, 2005. Human Rights Watch telephone interview with Alireza Mir Asgari, February 10, 2005. Human Rights Watch telephone interview with Abbas Sadeghinejad, February 14, 2005. Mojahed, No. 380, March 2, 1998 (on file with Human Rights Watch). Human Rights Watch telephone interview with Mohammad Hussein Sobhani, February 14, 2005 and May 6, 2005. Human Rights Watch telephone interview with Yasser Ezati, February 9, 2005. Human Rights Watch telephone interview with Farhad Javaheri-Yar, February 3, 2005 and February 25, 2005. Human Rights Watch telephone interview with Ali Ghashghavi, February 9, 2005 and May 6, 2005. Human Rights Watch telephone interview with Akbar Akbari, February 27, 2005 and May 6, 2005. Human Rights Watch telephone interview with Seyd Amir Mowaseghi, February 4, 2005.